Natural beauty and the outdoors is the main emphasis in this port. As you cruise into Eidfjord, the serenity of the surroundings encompass daily life for locals and is a popular destination for cruise ship passengers. Though this is a small village of around 1000 people, it is included in Norway's top wealthiest communities, predominantly due to the production of hydroelectric power. The largest city near Eidfjord is Bergen, though Oslo (Norway's capital) is a mere train or coach ride away. People venture from these larger cities to bask in the peaceful life Eidfjord offers. Largely populated cities are wonderfully vibrant and colorful, but once you have spent a day visiting Eidfjord, and experienced what it has to offer, you won't want to return home! Travelers love Bergen because it is one of the least intimidating, most friendly and relaxed cities in Europe, and is very rich in history and art surrounded by some of the most stunning scenery in the world. Whether you're looking to shop, sightsee, eat, hike, or just relax, you are sure to feel welcome in Bergen. Art Nouveau architecture, a historic fire, lighthouses, and fishing are all huge facets to Alesund's culture. Alesund is located atop three different islands in Norway, creating a unique and special experience for visitors. Cruising through fjords to approach the islands is an experience visitors are sure to remember. Trondheim is the third largest Norwegian city, and one of Scandinavia's oldest. It was founded by Viking king Olav Tryggvason, and was Norway's capital until 1380. Today, this university town is a hub for medical and maritime research. 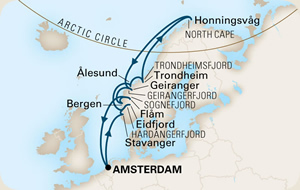 Honningsvag; gateway to the North Cape and home to the world's northernmost fishing village. From this scenic cruise port, enjoy the views and serenity that Northern Norway has to offer. Travelers prefer Flam in the summer because of the beauty of the dramatic fjords and all the outdoor activities. Whether you want to visit this "tiny Norwegian Disneyland" for its steep railway, shop, eat, hike, cycle or sightsee, you will not be disappointed with time spent in one of the most beautiful Norwegian ports.